We are excited to KICK OFF Baseball Season at Volcanoes Stadium on May 21, 2019 with a unique and delicious Greeters Event! 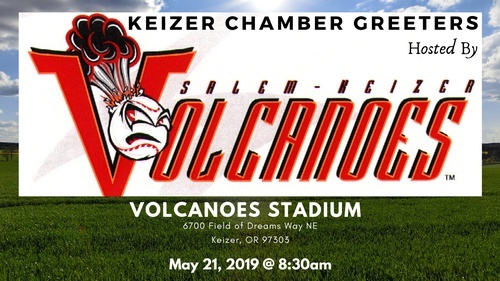 There will be a FULL complimentary gourmet breakfast catered G-Gourmet Catering and Events followed by a pre-season look at the exciting new changes coming to Volcanoes Stadium this year including new sound system, new signs, new menus, etc, The 2019 season starts 3 weeks after the Greeters event so this will be a great opportunity for membership to get the first sneak peek! Free networking event for members and guests. We welcome guests to attend up to two of our events before we ask that they join in order to continue to enjoy this popular benefit of membership with the Keizer Chamber.